Your host at Crystal Creek Lodge: Dan, Owner and Manager. Dan is an owner, manager, chief bottle washer, poet, philosopher, humorist (bad) and visionary at Crystal Creek Lodge. He oversees operations, hosts, flies one of the aircraft, and guides at the lodge, too. Dan is originally from Minnesota, where he lived the outdoor life from a young age and obtained his college degree from the University of Minnesota. He helped build the original Crystal Creek Lodge in 1988 and at that time began guiding in the Bristol Bay Area of western Alaska. Dan says: “What originally began as a summer adventure has become a life’s work. "Our mission statement is: “Inspirational Alaskan Adventure, Exceptional Hospitality”. We and the staff are grateful to you, our guest, for supporting the life we love through your being our guest at Crystal Creek Lodge. Fly-fishing experience at Crystal Creek Lodge: For many anglers, fishing Alaska is a dream come true. Most of the guests at Crystal Creek Lodge like catching a variety of fish species. All season long we have rainbow trout, dolly varden, char and grayling available. Throughout the season we have various salmon species to catch as well. King salmon are available from the second week of June to the end of July. Silver salmon are targeted from late July through the middle of September. The Rainbow Trout of Alaska are fish of legend. 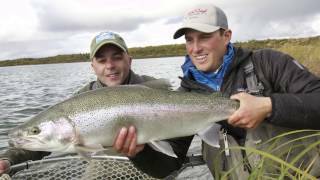 The Naknek River and streams of the surrounding Katmai National Park region offer the finest Rainbow Trout fishing in the world. The chars are common to arctic and sub-arctic waters, and thrive in the Bristol Bay region. They are aggressive, strong and beautiful fish that populate streams in prolific numbers. Prime King season is June 15 through July 30. Kings are the largest of the Pacific salmons. They average 15-30 pounds, though each year a handful of brawlers tip the scales in the vicinity of 50 pounds. Five Species of Pacific Salmon run the local rivers by the millions and they are thus available in prolific numbers. Click here for quick link country guide. The main lodge is a beautiful 7,500 sq. ft. building made of massive scribed logs & river rock overlooking the Naknek River. It is impeccably built, completely modern, warm, quaint and tastefully decorated with interesting art and Alaskan artifacts. Click here to view the lodge. To select and book the top suggested hotels and accommodation in the area when fishing at Crystal Creek Lodge, click here. by car or public transport to Crystal Creek Lodge.